Artist Molly Larkey, LATCH Collective, and At Home Housing joined together to organize an event for tiny house and community living enthusiasts. At the event, participants wrote down their vision for a community, and what questions they had about getting there. We did all this in the midst of the INHABIT exhibit by Molly Larkey, at the Ochi Projects space in mid-city Los Angeles. The exhibit had engaging, interactive, and inspiring pieces. The space was the perfect setting for great conversations about what we want to build in our lives. Visions that people wrote down included tiny house villages, artist residences, affordable and cooperative housing, space for gardening and sharing meals. Additionally, participants could see a place where everyone was valued, where they could work toward their goals, and co-create. There were many common questions: where can we do this? How can we finance it? Who is involved? LATCH Collective, Reworking Hope, and At Home provided information and cited many resources we can continue to develop in future workshops. Discussion groups talked about the questions raised, in themes of social values and governance, economics, and design. Topics the group wanted to pursue further included group decision-making styles and types, a design charrette, and a library of examples and possibilities. The workshop was titled “Place It: community visioning workshop,” and was held on a newly-purchased property next to LA Eco-village in Koreatown, Los Angeles, in a former auto shop building. Participants took seats in the tall-ceilinged space, amid the auto lifts and tables strewn with colorful objects. James invited participants to re-envision their neighborhoods through storytelling, objects, art-making and play. By using these methods, people could investigate attachments to place and shelter by thinking beyond words by building models to express ideas about home. The ideal communities created with the objects in the workshop had trees, nature, bridges, ponds, waterfalls, rivers, lakes, shared gardens, kitchens, outdoor places to play, and workshops. Places full of paths, elevation changes, children playing, green space. We could picture the sounds of people in conversation, water splashing, birds in the trees, animals roaming around. I was struck by how beautiful these models and visions of an LA could be. But also I thought of the contrast to our current build environment, full of cement, cars, and isolation. How much work we will have to do to create these places. Upon visiting many intentional communities in Southern California, they all say “start with a vision.” I believe we took steps toward creating these visions. In this way, we will be able to start projects on the right track with a strong sense of purpose. Members of CRSP at L.A. Eco-Village, the LATCH Collective, and At Home organized this workshop to connect interested members and move the planning process forward with hands-on workshops. CRSP is the resource center for small ecological cooperative communities based at L.A. Eco-village, the landmark intentional community in Los Angeles from which many aspiring community-minded people learn important lessons about communication, structure, and all things community. LATCH Collective is a member driven organization focused on co-building tiny homes in Los Angeles. At Home is an organization dedicated to creating housing opportunities for intentional communities, through organizing, training, and outreach. Participants were invited based on their interest in cohousing, intentional community, and tiny homes and villages. Hundreds of people in Los Angeles are interested in a different way of living. In this workshop, people were able to think about what that would look like. This will be part of a series to further develop the visions and plans for kicking off projects in 2017. While spending Valentine’s day searching for any new organizations I can contact about community housing, I realized I need help getting the word out! Compared to places in the Bay Area, Davis, and San Diego, I’m still surprised at how few communities I can find in Los Angeles. I believe that many people would be interested if they found out more. Please send around the information to anyone who may be interested. 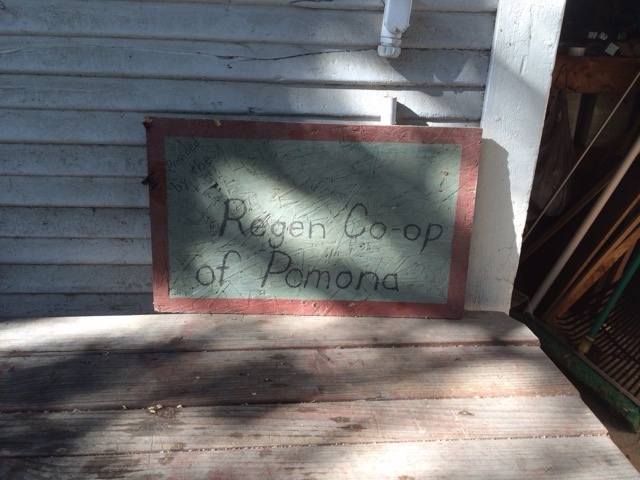 We had another opportunity to visit the Regen Co-op in Pomona and talk to some members. They made space for some great conversations about group dinners, diversity in members, house meetings, communication styles, what makes someone well suited for living in a community, and getting involved in the neighborhood in a way that really creates positive change that goes beyond the homes themselves. It also made me think of the need for mentorship of forming communities by the more experienced residents. An idea is simmering for a summit of LA communities to get together, find out the status and ideas of all the forming groups, as well as hear from existing community leaders. Being able to see their co-op and all the home projects they have worked on through years, it always makes me believe that creating a community is possible. Thanks again to the residents who spent their Saturday afternoon with us sharing their experiences. It is important to learn what everyone’s visions are, for what they picture doing in the community. Some people are most interested in having a bit more open land for gardening, and some wouldn’t mind having a smaller private living space if there are nice common areas. I have all kinds of questions about how the beginning of this process goes. Do we get ideas of property values so that we know what we’re in for? Do we all start learning group communication skills so that we stick together for the long run? If we go too long with the research process, will we lose people who are looking to move in a faster time frame? What I’ve learned so far is that our group wants a community that supports each of us in our individual goals, rather than trying to make us all fit into one mold in terms of philosophy or daily routine.